I made a quilt! Well, that is not really such news. But this quilt is for a bed, and is the first king-size quilt I have ever made. Here it is pictured on a queen size bed, as I don’t have a king bed in my house. This quilt is a gift, and was really fun to make. I think it might have been inspired by the zig zags I loved last fall in Tennessee. Off it goes to it’s new home! Lucky people receiving this beautiful gift! Beautiful quilt. Love the hint of transparency. It is very pretty. I love getting a good quilt off and finished. This is a wonderful gift. Good for you. Love this quilt! The dyed fabric looks so nice with the commercial prints. I tend to do quilts either with all hand-dyes or all commercial. This shows me how beautiful a mix can be. Also, I have a few patterns for zig-zag quilts, but none like this, which seems to have been made with an unusual shape for the main piece. I thought it was a rectangle with two triangles from the same fabric sewed on the ends, but I don’t see seams there. Is this pattern available to others? Would love to give it a try. I love combining hand-dyes with commercial prints. Truth be told, this quilt was a stash-busting one for me. It is actually a commercial “hand-dye” from the stash, but does give the effect of a hand-dye. 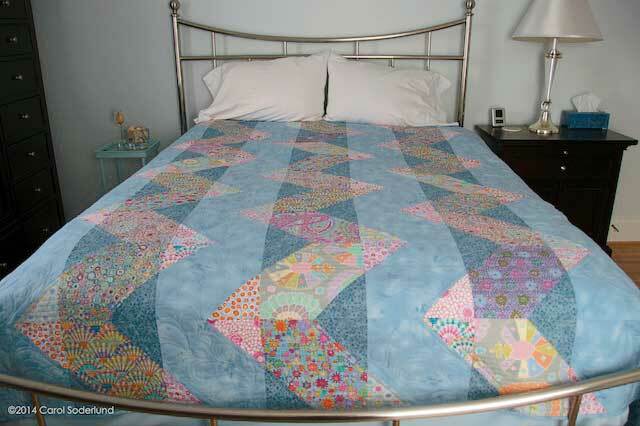 I do have lots of quilts that combine commercial prints and hand-dyes, though. There are some in my gallery. The main shape couldn’t be simpler. It is a square, with two diagonal lines forming triangles on opposite sides. I just drafted it in the size I wanted. I think you can tell best in the close-up view. 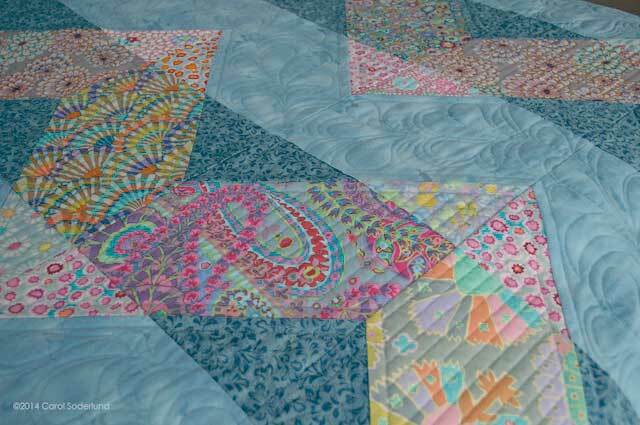 Keep in mind that in that photo the blocks are on point, although on the quilt the blocks are laid out squarely. I think you saw the block, but the fact that the darker blue fabric is repeated disguised the seam somewhat. I think I was inspired by a quilt I saw pictured on Pinterest, so there may be a pattern out there. It was simple to draft, however. A square and two lines! This is beautiful. I love making art quilts too… but there is something very special sleeping under something so beautiful! I’m sure the lucky recipient will cherish it forever.